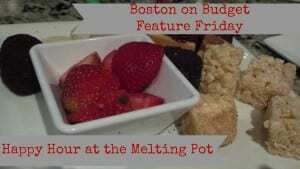 Feature Friday: Happy Hour at the Melting Pot! “This would make for a fun and inexpensive Valentine’s Day Date” my husband said a few months back while enjoying fondue at the Melting Pot’s Happy Hour. The Melting Pot offers Happy Hour Monday-Friday from 5-7pm and features their bar menu at 50% off food items. The bar menu includes both fondue items and regular food items like sliders, flatbreads, and more. Although our tab was more expensive than other happy hour specials since we did fondue and dinner like items, it was an unique dining experience that would be a great budget-friendly romantic option– perfect for Valentine’s Day! But Kate (that’s me), I don’t want to eat at a bar on Valentine’s Day! Also, don’t forget to check out the cheap eats page for even more great cheap eats and food deals in Boston!